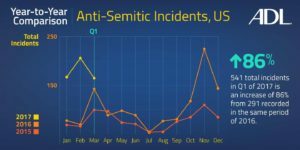 NEW YORK CITY (JTA) – Anti-Semitic incidents in the United States soared 86 percent in the first three months of 2017 after rising by more than one-third in 2016, according to the Anti-Defamation League.There has been a massive increase in harassment of American Jews, largely since November, and at least 34 incidents linked to the presidential election that month, the ADL said in its recent annual audit of anti-Semitic incidents. This year has seen preliminary reports of 541 anti-Semitic incidents through March. One reason for the jump appeared to be the bomb threats called in to Jewish community centers and other Jewish institutions across the country. An Israeli-American teenager is accused of calling in most of them, and he has been charged in Israel and the United States. He is in custody in Israel. The 2017 incidents include 380 for harassment, including the 161 bomb threats, an increase of 127 percent over the first quarter of ‘16; 155 for vandalism, including three cemetery desecrations, an increase of 36 percent, and six physical assaults, a decrease of 40 percent. The increase in anti-Semitic acts comes despite a low level of anti-Semitic attitudes among Americans. While there was a 34 percent rise in anti-Semitic incidents in 2016, an ADL survey earlier this month found that only 14 percent of Americans hold anti-Semitic views. Social Contract Not In Place? 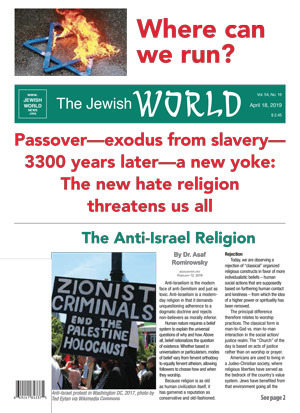 A study this month from the European Jewish Congress found that violent anti-Semitic incidents worldwide fell to 361 in 2016 from 410 in 2015, a decrease of 12 percent. Kantor attributed the decrease, which was most dramatic in Europe, to ramped-up security at Jewish institutions and more government funding for Jewish communal safety. In 2016, the ADL report showed a total of 1,266 acts targeting Jews and Jewish institutions, with a 34 percent increase of incidents of assaults, vandalism and harassment over the previous year. Nearly 30 percent of those incidents, or 369, occurred in November and December. The states with the highest number of incidents were those with large Jewish populations, including California, New York, New Jersey, Florida and Massachusetts. The acts included 720 harassment and threat incidents, an increase of 41 percent over 2015; 510 vandalism incidents, an increase of 35 percent; and 36 physical assaults, a decrease of 35 percent. Incidents on college campuses stayed mostly static after nearly doubling in 2015, but more than doubled in non-Jewish elementary, middle and high schools. The rise to 235 incidents in 2016 from 114 the previous year represented a 106 percent increase. There have been 95 incidents reported in the first quarter of this year. The ADL numbers do not include online anti-Semitism, including a wave of anti-Semitic harrassment on Twitter. A 2016 ADL report tallied 2.6 million tweets containing anti-Semitic language between August 2015 and July 2016. Greenblatt said Monday that the anti-Semitism statistics would be “off the charts” if cyber hate were included. The ADL has been tracking anti-Semitic incidents since 1979. In the past 10 years, reported anti-Semitic incidents peaked at 1,554 in 2006. Separately, Tel Aviv University’s watchdog on anti-Semitism has reported that the number of anti-Semitic incidents worldwide has decreased by 12 percent in 2016 despite the spike in the United Kingdom and the United States. 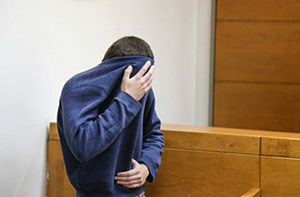 JERUSALEM (JTA) –Israel’s Justice Ministry reportedly denied a U.S. request to extradite the Israeli-American teen charged with making threats against Jewish community centers throughout the United States. The State Attorney’s Office in Israel told the Justice Department that although the 18-year-old is suspected of committing crimes in 10 countries, he will be tried in Israel, Israel’s Channel 2 first reported Sunday, April 23. 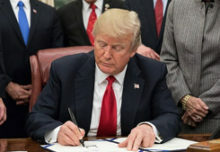 The report added that the U. S. has not backed off its request and that Israel’s denial has not caused a rift in the relationship. The teen from Ashkelon, in southern Israel, who was arrested in Israel last month for allegedly making over 100 threats against Jewish sites in the U. S., has been named in the U. S. but cannot be named in reports originating from Israel. Israel’s State Prosecutor’s Office is expected to file a indictment against the teen, Channel 2 reported, including charges of extortion with threats, causing panic and money laundering. Channel 2 News reported Saturday night that the teen said during interrogations in Israel that he had offered his “threat services” for payment. The Justice Department said Friday that it was charging the teen with 28 counts of making threatening calls to JCCs in Florida, conveying false information to the police and cyberstalking. “Today’s charges into these violent threats to Jewish community centers and others represent this department’s commitment to fighting all forms of violent crime,” Attorney General Jeff Sessions said in a statement Friday. The teen’s parents and attorney have said he has a benign brain tumor that affects his behavior. Israel has complied with requests to extradite Israelis since the 1990s, given that those sentenced to serve in prison can do so in Israel, according to Haaretz. 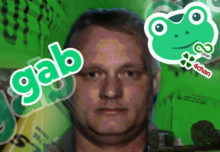 What is Gab and where else are anti-Semites gathering on the internet? 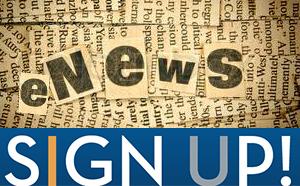 Mixed reactions after prosecution efforts at UCLA and UCI: Will disrupters be charged?